The sixth form kicked off the new academic year with an Art trail visiting a number of different venues as part of Herefordshire Art Week or “hArt”. 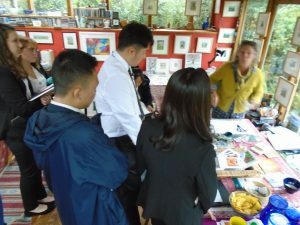 Their first stop was at the Art Collective which is housed in the Old School in Knighton, next door to the Offa’s Dyke centre. There are many artists who have their studios at this venue, and who transform their spaces in to exhibition spaces. Outside there are several artworks by the sculptor Andy Hazell and we can see his “Green Car” commissioned by Friends of the Earth. This shows a cow sitting on the roof of a VW Beetle with the comment that cows produce more greenhouse gases than all of human culture! 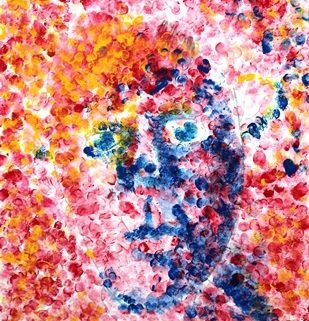 The young artists also visited the Sidney Nolan Trust to see an exhibition of paintings by Celia Perceval who has explored both the shoreline of New South Wales in Australia (from where Sidney Nolan originated) and the Welsh Marches, where Sidney Nolan ended up. 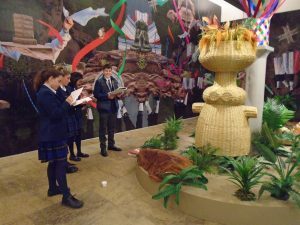 The vibrant bright colours and the ‘scratchy’ technique of Perceval were appealing to the students, as were some works in a side gallery created by inner-city youths at a recent workshop. From Presteigne the students travelled to Kingsland, to St Andrew’s Church which was hosting an exhibition of 18 varied painters, sculptors and craftspeople. The variety meant that there was something for everyone’s taste. Homeward bound, the group took a pit stop at the studio of Brontë Woodruff, a regular staging post on the annual tour. She is always very welcoming, offering not only a feast of her paintings but also tea and cakes for those who would like them. Throwing in a miniature masterclass in the use of van dyck crystals, and it turned in to a very valuable stop-over. 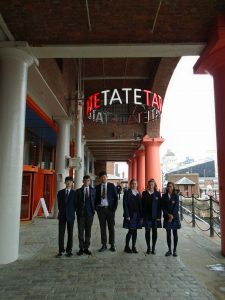 Meanwhile, Year 10 artists visited Tate Liverpool to see the exhibition of small scale sketches and paintings by Egon Schiele. Schiele has a very fluent and unhesitant drawn line – the kind of line students are trying to emulate in their own work. The students made a number of sketches while visiting the gallery and, in response to these they have tried to draw each other, from observation, but with this type of confident drawn line.